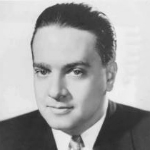 Vincent Lopez (30 December 1895 – 20 September 1975) was an American bandleader and pianist. Vincent Lopez was born of Portuguese immigrant parents and was leading his own dance band in New York City by 1917. On November 27, 1921 his band began broadcasting on the new medium of entertainment radio; the band’s weekly 90-minute show on a Newark, NJ station boosted the popularity of both himself and of radio. He became one of America’s most popular bandleaders, and would retain that status through the 1940s. Lopez worked occasionally in feature films, notably The Big Broadcast (1932) and as a live-action feature in the Max Fleischer cartoon I Don’t Want to Make History (1936). In 1940, he was one of the very first bandleaders to work in ‘Soundies’ movie musicals. In 1941 Lopez’s Orchestra began a residency at the Taft Hotel in Manhattan that would last 20 years.